Savory’s TED talk was compelling and certainly provided what all carnivores wanted to hear (hence, the standing ovation). Nevertheless, it was riddled with inconsistencies and unsupported claims, and it suppressed key information in a calculated manner. A number of hurdles obstruct the path of evolution toward more sustainable, peaceful food production systems. One such hurdle is the perpetuation of belief that sustainability can be achieved if we simply modify our current animal production systems. Many authors, scientists, and organizations are happy to spread this message and have ample perceived public platform to do so. This invariably leads to distortion of reality, suppression of facts, and an appeased global audience still clinging to some form of justification for eating meat. Two distinct misrepresentations characterized his talk: (1) that desertification is an isolated problem by itself; and (2) that increasing livestock production in affected areas of habitat loss will solve the problem of desertification. Perhaps the more significant of the two is the very precept from which he built his case — that desertification is a stand-alone concern, impacting food security and our future survival. It is actually a manifestation or side effect of something else — deforestation, which is a by-product of our choice of foods. Aside from naturally occurring deserts, which are healthy components of our earth’s varied ecosystems and habitats, there are two forms of man-made deserts — those that were once primary ancient grasslands/ savannas and those that were once forests. Grasslands are being lost at an alarming rate. However, of much larger concern is that most grasslands were once forests, and we are cutting down forests at a rate of 30 million acres per year, globally. Another 20 to 30 million acres of forests are being degraded (destroyed by thinning and creating roads and disruptive corridors). These deforested areas are eventually converted to grasslands for cattle or for cultivating crops to feed livestock. Savory focused the audience’s attention to a NASA aerial photograph of the world, and he highlighted regions that are most affected by desertification — the Amazon basin, numerous countries in Africa, and temperate regions in Asia — but he failed to mention that nearly all of those areas were once forests, now turned into pastures for cattle. 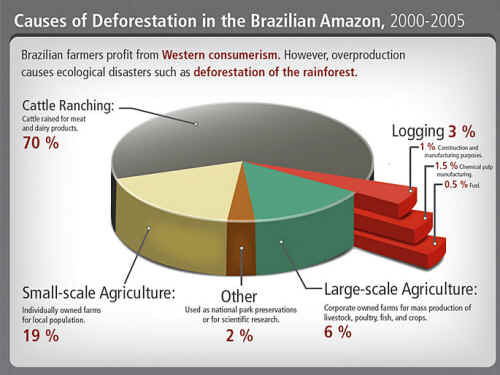 Nearly 90 percent of the deforested areas of the Amazon are the result of the meat and dairy industries. These deforested areas then become eroded and eventually desertified, losing valuable topsoil along the way. The problem at hand is that we eat meat. Eating meat causes demand to raise more livestock, which is a miserably inefficient use of land as well as other natural resources, requiring from two to twenty acres to support just one cow. 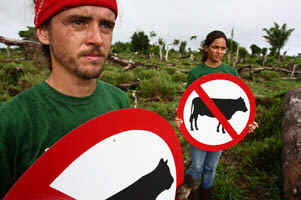 Therefore, in the pursuit for more land, raising livestock causes deforestation. Deforestation then causes erosion and topsoil loss, which then causes desertification. If we stopped deforestation, we would stop desertification. If we stopped eating meat, we would stop deforestation as well as loss of ancient grasslands. Savory provided the audience with examples of restored land using his livestock and grazing techniques in Africa, Argentina, and Mexico. Argentina, though, has lost over 66 percent of all its forests over the past seventy-five years, with current deforestation rates at 210,000 acres per year. Over 40 percent of all plant and animal species are negatively impacted in that country. Zimbabwe, where most of Savory’s studies have been conducted, is destroying their forests at rate of 1 percent per year, which doesn’t sound impressive, but they have already lost more than 85 percent of their original forests, primarily due to raising livestock. Desertification is occurring as a by- product of this deforestation as well as combined with subsequent pastoral herding. Savory states the cause of desertification is somewhat a “mystery.” But the primary cause is due to grazing livestock. It is no mystery. Closer examination of Savory’s techniques of holistic management reveals they do not work as well as he states. His idea of “mimicking nature” is to place up to 400 percent higher cattle density in small, desertified areas of grasslands and rotate them in an attempt to replicate the movement and soil compaction by hooves of massive ancient herds of grazing animals. Numerous authors have studied the effect of Savory’s and similar methods in Africa and North America and have demonstrated that, in most cases, short duration grazing “reduced individual cattle productivity due to stress from heavy stocking and movement of cattle” and that these methods “do not provide a unique means to favorably modify rangeland composition.” When compared to rotational grazing, studies have shown that conventional continuous grazing methods displayed greater plant health and production in 87 percent of the cases. Studies by the chief of field and pasture extension in Zimbabwe (Gammon 1984) and others (Vaughan-Evans, 1978), compared the Savory Grazing Method (SGM) to less intensive management and showed that Savory’s methods were “not superior to less intensively managed areas.” One study pointed out that during an eight-year period of time, where SGM showed some degree of success, there happened to be an unusual amount of rainfall (50 percent above normal for that area), which likely boosted any positive results Savory had recorded. Within two subsequent years of normal rainfall, continued use of SGM produced an observed progressive deterioration in pastures and animal performance. Savory argues that many desertified areas of the world can only be used to grow animals, not plants, to feed people, suggesting that there are no alternatives to eating meat for people living in these areas. 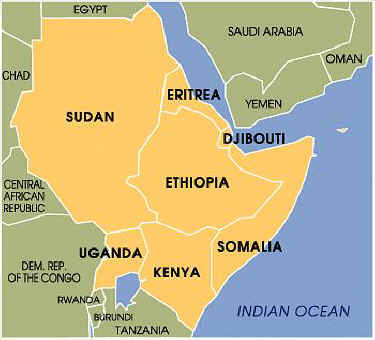 One of these areas Savory uses as an example is the Greater Horn of Africa (GHA), which comprises eight countries and covers six million square kilometers. The entire region has experienced severe conflict and disturbances in some form in the past decade, and it is one of the most highly desertified regions in the world, having lost more than two-thirds of its topsoil. Here, Savory argues that providing them with livestock is the only hope they have of saving their families because, as he states, “95 percent of the land in the GHA can only feed people from animals.” Savory’s approach for this region would be to raise livestock in massive numbers to help restore pastures and then slaughter them to help feed people. Typically, these areas are drought- ridden and the people plagued by poverty, hunger, and illiteracy. It would make more sense to optimize sustainability by producing a type of food that is the most efficient to grow — least water usage, no GHG emissions, least land needed, and healthiest for humans to consume. When compared to plants, raising livestock seems illogical. Wherever pasture can grow or be restored to feed livestock, other plants could be grown as well — to be eaten directly by humans. It’s interesting to note that livestock already occupy 44 percent of the total land surface of the eight GHA countries and are directly responsible for use of the sparse natural resources available for their human population. The country of Eritrea, for instance, has a human population of 5 million people yet is using their very few resources to support 6 million cattle, sheep, and goats. Ethiopia is cutting down 25,000 acres of their forests each year in order to make more room for their growing herd of livestock, now the largest in Africa, while their human population suffers from lack of food. It’s quite clear that use of sparse and dwindling natural resources for livestock in the GHA is essentially choking the struggling human population. Yet Savory’s plan would be to add more livestock to the region. And then there is the problem with loss of biodiversity. Savory has not addressed how he plans to restore loss of the ecosystems and plants, animals, and insects that were originally present before livestock ruined the landscape. When he places cattle and livestock into an area that has been deforested and now desertified, what is the plan to bring back the natural, indigenous flora and fauna — a number of which are now extinct? Many desertified areas, including those in semi-arid regions would be much healthier and more productive if restored in a resource- efficient manner with indigenous drought-resistant plants, agroforestry, implementing terracing and other organic methods, or plant-generated microbiological measures, rather than with livestock. One of these measures is the reintroduction in desertified land of arbuscular mycorrhizal fungus (AMF) and various plants, such as legumes, which then form a highly evolved mutualistic relationship. This is one of many complex symbiotic interactions lost when cattle are introduced to an area. There is another way, then, to mimic nature — by truly mimicking nature. Adding domesticated cattle to desertified landscape as a measure to compensate for our mistakes of decimating the normal flora and fauna over the decades creates many issues. Savory’s methods may indeed restore some desertified grasslands but so would plant-based food production systems or simply reintroducing the original natural blend of species (plants, animals, insects, microbes). Wherever Savory speaks, he conveniently fails to mention that deforestation and degradation of tropical forests and subsequent transformation to pasture are the primary global reasons for initializing erosion, decreasing soil fertility, and eventual desertification and heavy contribution to climate change. Prevention, therefore, is key, not acting in a retrospective manner with concepts that confuse industries, agriculturalists, and consumers. If “mimicking nature” is what he desires, then Savory should consider reintroducing the 10 million acres of forests lost each year in Africa (part of the 4.5 billion total acres lost globally over the past few hundred years), primarily due to the introduction of livestock. He should add the correct number and density of wildebeests and other grazing mammals that were lost due to deforestation — add the 140,000 lions, leopards, and other predators back into the equation and all other wildlife and biodiversity that has been destroyed over the years by human activities — that would “mimic nature”. From 1955, when he served as game ranger/officer in Northern and Luapula provinces of Rhodesia (now Zambia), through 1969, Savory supervised the killing of game animals and advocated the mass culling of elephants and hippos, convinced that they were destroying the habitat. Savory was also a farmer, game rancher, consultant, officer in the Game Department, and politician based in Southern Rhodesia (now Zimbabwe). As such, he called for a project to slaughter more than 40,000 elephants — until it came under heavy criticism when officials realized that these gentle, innocent giants were not the problem.78 While Savory was arguing for a calculated slaughtering of animals, others, such as Lawton and Gough, were suggesting that elephants were not the problem at all. Rather, it was the repeated burning or human-induced fires in the dry season (from slash- and-burn/swidden agricultural methods) that might be the real reason for desertification. At the time, R. M. Lawton was an ecologist with the Land Resources Division of the British Directorate of Overseas Surveys, and Mrs. Gough was a skilled observer of animal behavior in Zambia. Savory’s holistic management or “mimicking nature” philosophy appears to be merely a facade of many sorts, since his operation and overriding objectives are in full support of increasing the meat and dairy industries. This is evidenced by his stated philosophy, which is supported by every program with which he’s been involved in the U.S. and developing countries over the years. His leading team members (Director of Research and all co-founders of the Savory Institute) are derived entirely from the meat and dairy industry. Most of them own and continue to operate very large cattle and other livestock ranches for the purpose of slaughtering, selling, and eating meat, not necessarily to improve their own grasslands. Restoration in this sense is complex and insidious. It is true that mob/rotational grazing by livestock could help selected, previously desertified areas in certain developing countries. But it comes with a price undisclosed by Savory or other permaculturists—misdirected resource use. The same land used for grazing could be used for producing plant foods for humans to eat directly. Water is being used for livestock, rather than directly by humans. There is an increase in GHG emissions, disposition (slaughtering) at the end of the animals’ tenure, and production of a food product that is much less healthy to eat than any of a number of plants that could have been grown. On its surface, Savory’s process may look attractive, but it obscures the Savory Institute’s objective of feeding a certain portion of the world with increased meat and dairy products by way of herd management of desertification.